A face with short straight-lined mouth, closed eyes, and inverted curved eyebrows. This emoji has a lot to think about, likely something rather serious. It is often best to give this emoji a little time by itself to fully contemplate and resolve its thoughts. Pensive (google: define pensive) - Adjective - Engaged in, involving, or reflecting deep or serious thought. 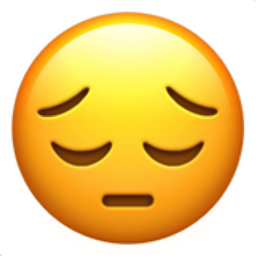 iEmoji old name: Weary Face Tired (incorrect). Distraught. Saddened. A somber mood is shown.